LENSES: Ten Ways to Interpret the Movies You Love (and some you hated) by Philip J. Hohle, Ph.D. ...This remarkable influence is why it is so vital that viewers learn to read film. It is not so we can all have the same interpretation. I think of the old school literature professor who refuses to recognize any alternative interpretation of a classic poem. Recall the first literature class John Keating has with his students in Dead Poet’s Society4. Keating has his students rip out pages in the textbook that proposed the goodness and truth of a poem could be measured scientifically—leading to a singular, objective interpretation. Conversely, the lessons in this book serve more like a guide to make us more sensitive—more aware of both the effect proposed by the filmmaker (e.g., the film craft as a noun) as well as the affect film has on us (as in a verb). In becoming literate, we become aware of the power we give film. But do not worry that your nuanced sensitivity will spoil your enjoyment—not like how a backstage tour of Disneyland diminishes the magic. Instead, I argue our literacy makes film even more powerful. We become more aware of the subtleties most viewers miss. Knowing more about the craft makes one appreciate it so much more when the film is indeed well made. Becoming fluent means you can help others toward a higher appreciation of such well-made movies. Fluency for me means one can interpret film for the benefit of others—to heighten their own literacy. This increased competency can mean you will more fully love the good movies you love. Likewise, you will help open other’s eyes to seeing disruptive films for what they really are. To our friends, parents, children, and the stranger in line at the film festival— we are critics. And the more fluent we are, the more we provide useful lenses for others to use. 4. Dead Poet’s Society, directed by Peter Weir (1989; Touchstone Home Entertainment, 2012), BluRay. Find this book on AMAZON in both paperback and eReader editions. NOTE: THIS WAS THE POST ANNOUNCING THE FALL 2018 SERIES. Participants will explore and practice ten valuable lenses that can make them fluent in their media consumption—better at making sense of the messages and meanings behind their favorite movies. Improve your media literacy—become fluent in reading popular film. 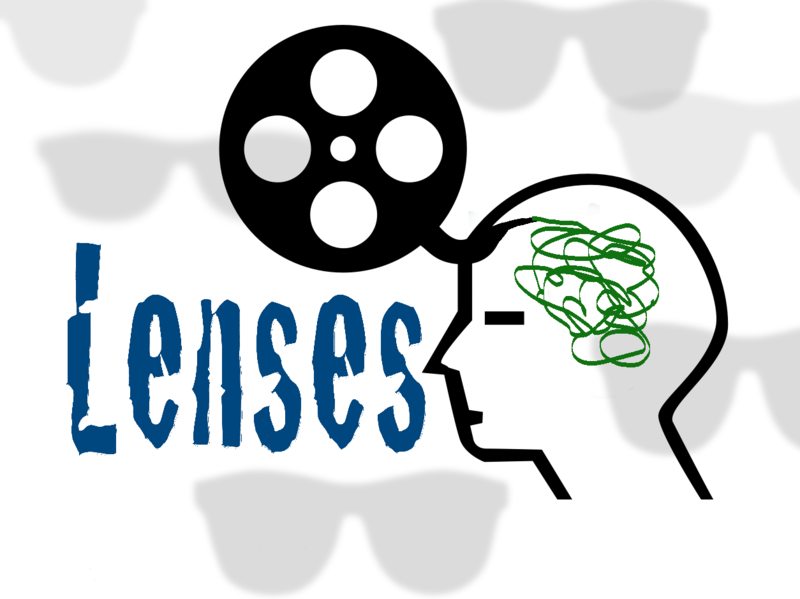 The Lenses series is parallel to the Cinema and Religion series offered at The Moviehouse each spring. Focusing on film, the two classes provide examinations of this compelling media form in the context of an actual movie theater with an audience—the most pure and powerful viewing environment. Instructions for registration is found here. For more information, visit the FAQ page. The course registration does not guarantee a seat at the screening. Participants must reserve their seat each week by using this form. A limited number of guest seats are available each week, but they must pay a single-night registration. Reserve a seat for each guest using this form before paying the fee. Our license agreement prevents us from using the title of the films in our publicity. The list of actual film titles with screening dates will be included in the course material provided for those who register. In the meantime, read the kind of key question used for each screening and the kind of film that will lend itself to the examination. The film this night is about a woman's fight to get justice for her daughter, based on a true story. The participant will look closely at the facts surrounding the actual event and ask if any discrepancies take away from a full appreciation for the film. Also ask, what films require consideration through the lens of accuracy. Furthermore, consider what films should be exempt from the standard of accuracy. The film this night should be judged according to how beautifully the movie is made. For example, one can look at the cinematography, costumes, set design, music score, editing, acting, and direction and ask if these elements demonstrate mastery in film production. As such, one is less worried about the impact of the story. The film for this night uses the plot of one of Shakespeare's plays. As such, one can also ask if the film's script and direction equal or exceed a stage version. September 24. From the lens of Narrative, ask: “What is the story all about?” The film on this night is a retelling of Homer's Oddessy. According to Joseph Campbell's monomyth, a hero is sent on a journey to recover a boon or treasure. Along the way, s/he meets antagonists that try to stop the quest. Often, the hero finds help from unexpected sources—thus enabled to return a boon to the community. The participant should see how closely this film follows the monomyth (hero's journey), and look for variations in the story. For any film, the viewer must seek coherence in the hero's journey before any deep identification can take place. October 1. From a Socio-Cultural lens, ask: “Why do they treat each other this way?” First one must self-examine the social or cultural context that shapes one's identity. Certainly, how you view a film is filtered by those experiences. Next, examine the film's characters with the same understanding of how different cultural backgrounds and social orders motivate or explain the interactions characters have with each other. In this film, we have a mix of nationalities and ages along with another sort of culture. Watch for cultural and societal norms that satisfactorily explain the motivations of characters. Look beyond a simple mismatch of personalities. Ultimately, see how easily you identify with characters who come from a different context. Ask if the filmmaker's norms and traditions are the same as yours. October 15 (no screening on the 8th). From the lens of Psychology, ask: “What is the story really about?” It is in the unconscious where the influence of film's story is often most potent. Can the film's impact on you be explained by examing the experience through a Freudian understanding of the battle between the childish ID and the moral Superego—mediated by the realistic Ego? This film is about how painful events that are suppressed or repressed can affect conscious behavior. Note that even the filmmakers may be expressing ideas that even they may not be aware. October 22. From the lens of Semiotics (symbolism) ask: “What metaphors can be found?” A good filmmaker will fill the experience with clues to deeper meanings, some of them triggered by psychological sensors. Few actions or objects in a film are unintentional—they are inserted to remind the viewer of something important. The participant will learn to spot what has things have particular relevancy and which do not. Such an understanding of these clues will help one make sense of a character's actions and artifacts and what role they play in driving the story. This film is filled with such hints—one such involves the appearance of a white shirt that never becomes muddy. October 29. From the lens of Value, ask: “What is important to them?" For this lens, the participant should not judge the character, but merely ask what value system is represented in the behaviors and artifacts prevalent in the film. Look for the conflict of values—the Socio-cultural lens may be helpful in differentiating one system from another. In this film, a character falls temptation to the appeal of money, and in the process, he devalues the ultimate wellbeing of his family. Another main character discovers what he has valued all along is no longer enough. Another character is relentless in pursuing what he values. Ask if the values espoused by the protagonist-hero reflects those of the filmmaker. November 5. From a Rhetorical lens, ask: “Does it persuade?” Indeed, there is persuasion hidden in many films. The participant will learn to ask, what idea is being advanced? What action is called for? Ultimately, ask if the filmmaker was effective in causing one to change perspectives on an issue. If so, what means of persuasion were most powerful (logos, ethos, or pathos) in reshaping your perception? Consider what formal elements used by the filmmaker best supports their rhetoric. This film will depict a change sweeping across an entire city, starting with a single character. Did you feel the same? November 12. From the lens of Ideology, ask “What worldview does this film promote?” Of course, a worldview is a belief system made evident by closely held values, which are manifest in behaviors and artifacts. Combine the Rhetorical, Semiotic, and Value lenses in asking what foundational belief is represented in the film. Once identified, ask if the film's stance is different from your worldview, or if it was successful in persuading you to change or affirm your beliefs. This film sends a subtle message one may miss due to the spectacular distractions of the performances. November 25 (no screening on November 19). From the lens of Genre, ask: “Is this true to form?” Typically, we might start with such a lens, as it is perhaps the most common lens used today in light of the popularity of the comic book genre. We compare films to other similar films in asking if they are representative of the best in that genre. Of course, genres only exist because views and critics alike need categories to help them make and defend their judgments. In this film, we will see if it can be considered to be among the best Christmas movies ever made. If so, what elements (using a Formal lens perhaps) makes it so?